Model 3150 uses a patented push-button stainless steel valve assembly allowing for front access stream adjustment as well as cartridge and strainer access. The "Hi-Lo" adult or child barrier free design allows the square pedestal to be placed securely in multiple locations, all while providing for twice the users as regular drinking fountains. Equipped with vandal resistant components, this fountain is not easily disrupted, quickly discouraging the worst of vandals. Configurable to Adult or Child barrier-free capabilities combined with its ease of use allows for a number of installation location possibilities. Model 3150 meets current Federal Regulations for the disabled including those in the Americans with Disabilities Act. Haws manufactures drinking fountains, electric water coolers and electric drinking fountains to be lead-free by all known definitions including ANSI/NSF Standard 61, Section 9, California Proposition 65 and the Federal Safe Drinking Water Act. 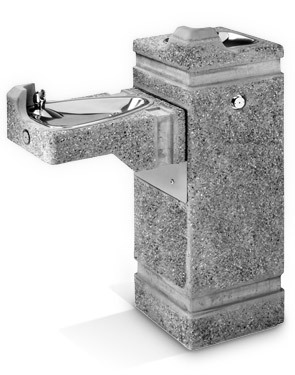 Model 3150 is a "Hi-Lo" barrier-free, concrete pedestal drinking fountain with exposed aggregate finish and 100% lead-free waterways. Bottom access plate for a concrete arm fountain. Access plate, 5" x 6" without hole, to cover optional hose bib area.